At BeColourful, we not only love the bright colors of the Rainbow collection, but we also love the soft pastels of roses and flowers. They remind us of a summer breeze, the soft movement of lace curtains, humming birds, and beautiful blue skies. 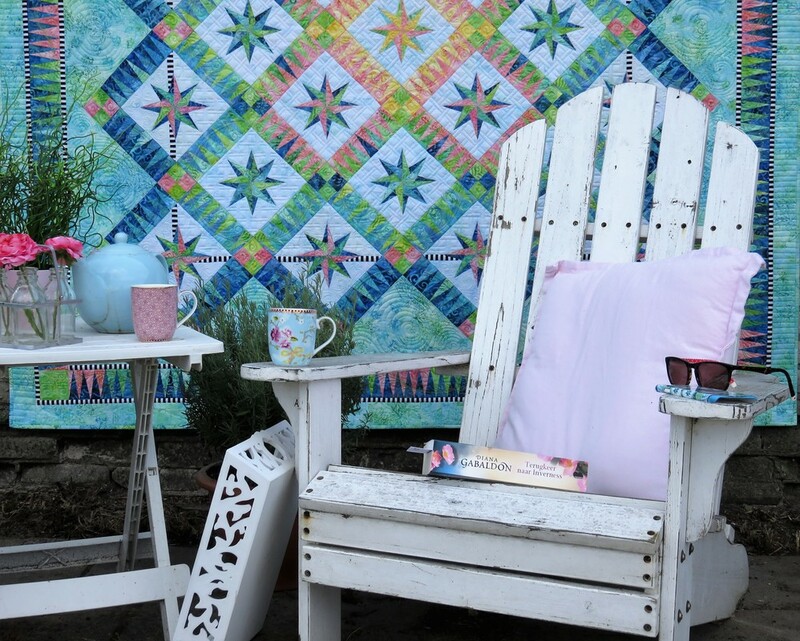 Be inspired by nature and select soft colored fabrics to make your own beautiful BeColourful quilt in blue, pink, peach, lime, delicate green and other Spring and Summer colors. Be happy! ​Another breathtaking design. Summer Breeze in the gorgeous pastels of Jacqueline's batik collection. You know she designs her own fabric, right? Curious for her collections? Go to the button 'Fabric Collections', and you will fall in love with them. ​It was not easy to came up with a name for this gorgeous quilt. But 'La vie est belle' suits just fine for this beauty. Craftsy and Jacqueline have put their creative heads together and created an amazing online class which you can take where ever you are, whenever you want. Have you always wanted to take one of Jacqueline's classes, but did you never get the chance because you were too busy, or she just wasn't in your area? This is your chance to learn from the best! ​Joyful is made by me only to show how the original quilt ”Joy” would look when you use some more romantic or traditional flower fabrics instead of the bright and colorful fabrics. We had no intention to release this quilt as a pattern (There was a pattern already called “Joy”) but there were so many request that we decided to make is as a pattern on its own and this is one of the quilts of our Rose Collection. There is still a pattern available to make this quilt yourself. The pattern package contains the templates of each pattern part on true to life scale, but you have to do the tracing yourself. This will make the journey to make this quilt even more challenging! 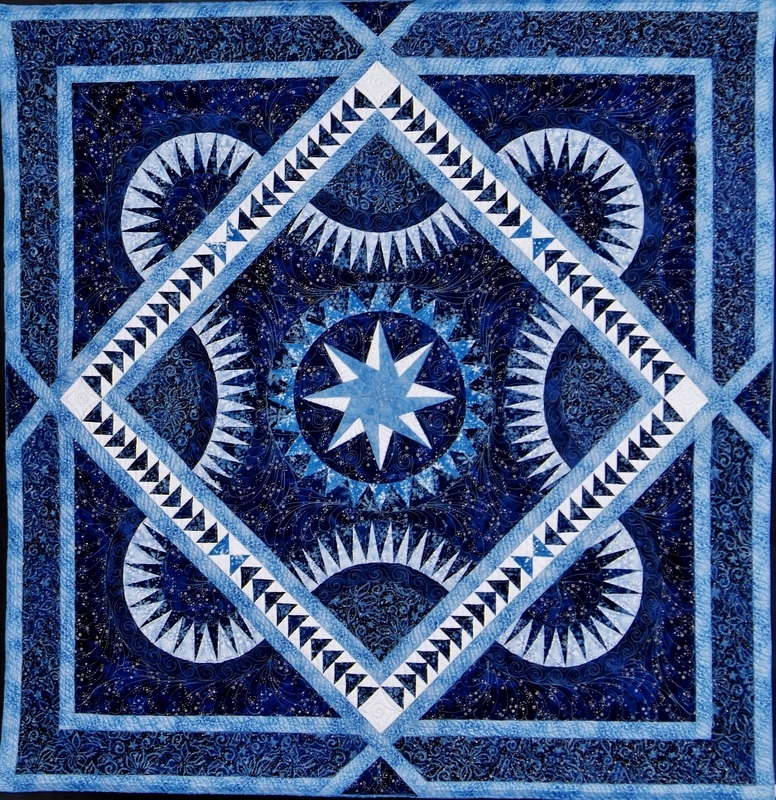 ​This is not only a New York Beauty quilt, but also one of the most traditional designs. A lot of quilters love to make New York Beauties. The spiked circles, the blocks, the lovely corners with the half round circles. It definitely is a pretty quilt. I've designed and makes this quilt years ago. It is still a pleasure to look at. The pink colors, the flower fabric and the stripes making this quilt timeless. This quilt is beautiful in any color scheme. ​Morning Glory has been one of my favorites! The first Morning Glory was made from orange, red and yellow fabrics. 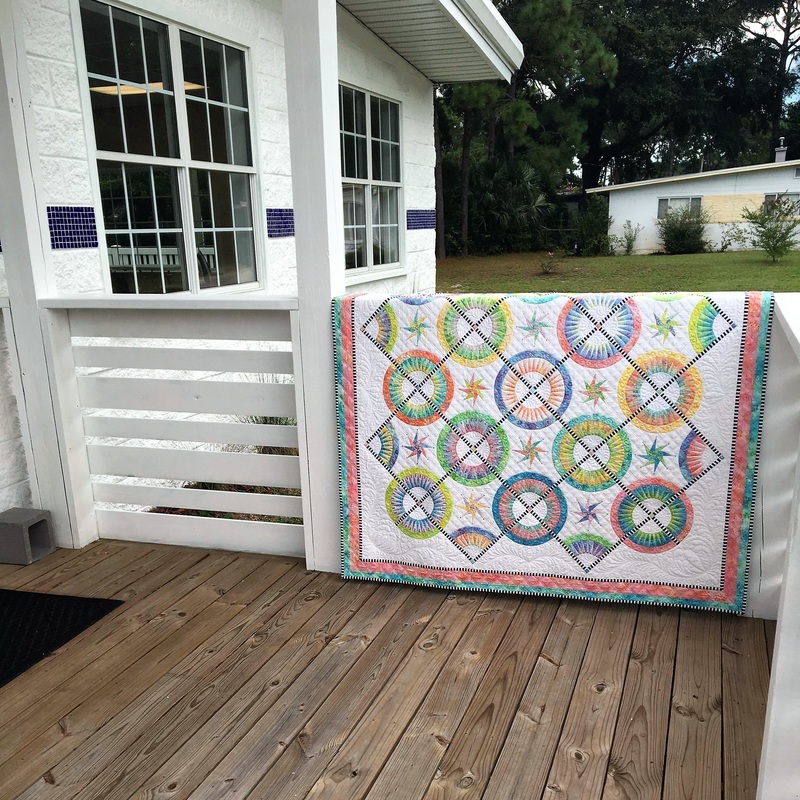 But to inspire quilters, Jacqueline has made this quilt also in warm brown and lime green. In this quilt you see that the right fabric choices can add something to a design. The tiny center star and the spikes around the star, the beautiful star points with the flying geese and the brown background fabric shows the center of Morning Glory much better and you can see the hexagon shape in a way that is amazingly easy to make. 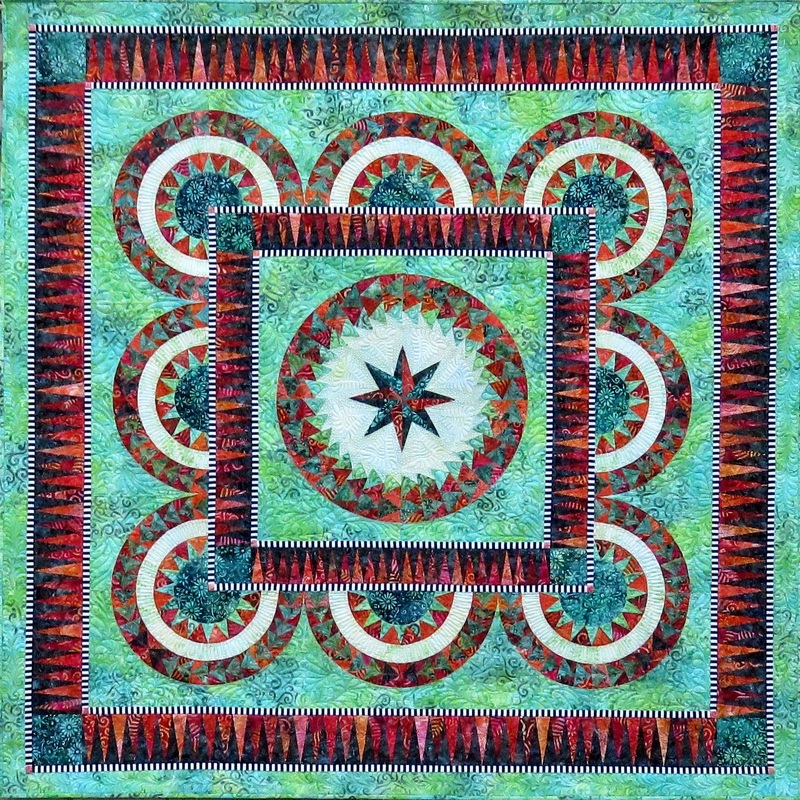 This stunning quilt is made with a beautiful Lone Star in the center, New York Beauty Beauties arches in the corners of the Lone Star points and the outside corners and flying geese set into a circular design and framed in a square. Seasons is a combination of paper piecing and cutting. You have to make the Lone star in the center from strips and you cut the star points in a 45° angle using a ruler. 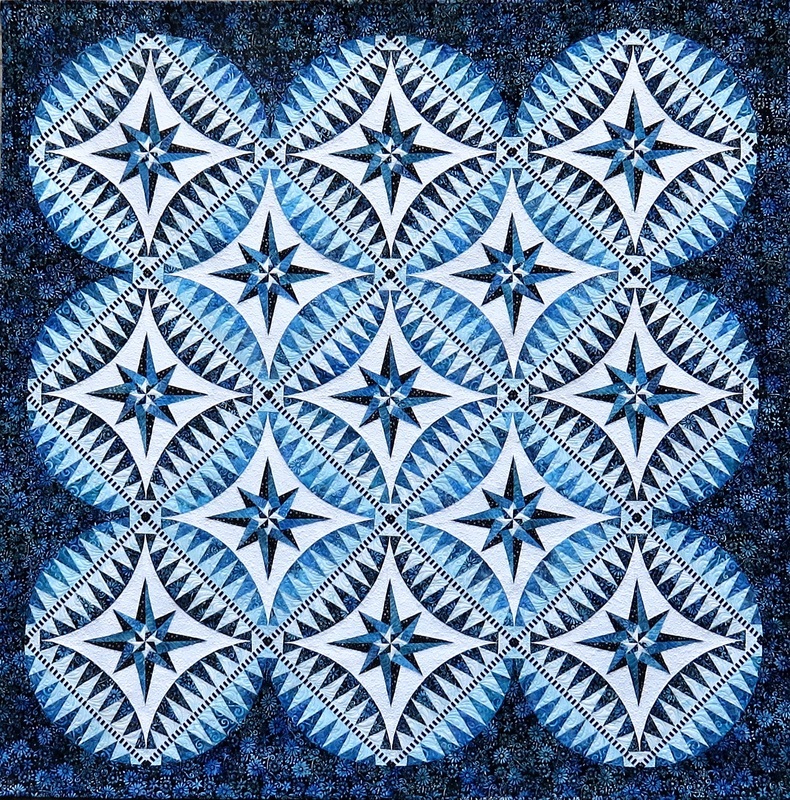 The remaining of this quilt, including the New York Beauty arches, the Stars and the Flying Geese are made with the paper piecing technique. Surprisingly Red is my favorite. Why….I don’t know. It is a quilt that is appealing by the use of the colors and radiation. For another reason I am happy with Surprisingly Red. The search for the colors is quite a story. 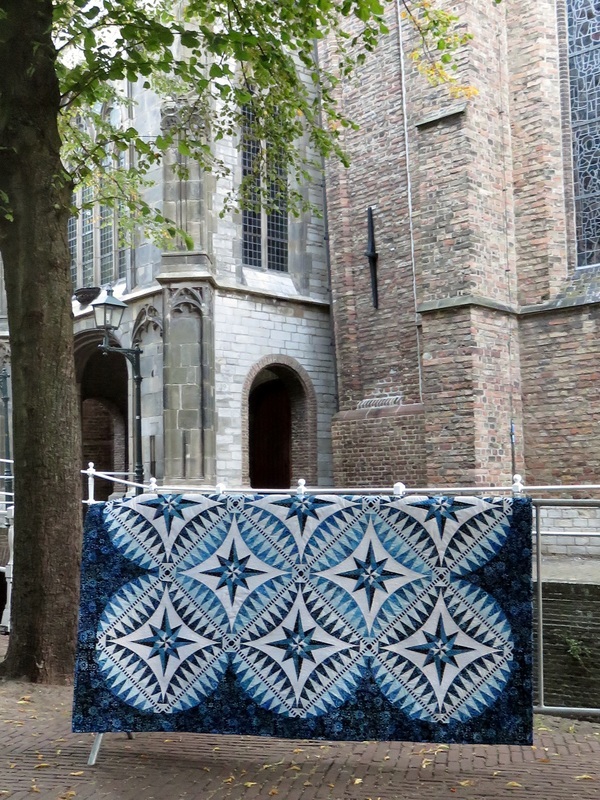 I had the fabric with the large roses in my house for a long time and at the Quilt Expo in The Hague I found the combining Moda fabric. Of course I bought too much, but…you never know.. In my mind I saw the quilt in front of me. Beautiful roses and soft pastels were screaming for beautiful pink fabrics and combinations. Unfortunately the search through my cabinets brought many different pinks in very much deviations but those pinks did not justify my beautiful rose fabrics. In fact, it became a pale combination. Not exactly what I had in mind. We started to search for other colour groups and we came up with red. That is the reason why this quilt is called : “Surprisingly Red” Only for the reason that we were so incredibly surprised by the combination of warm red in this pastel colored fabric. 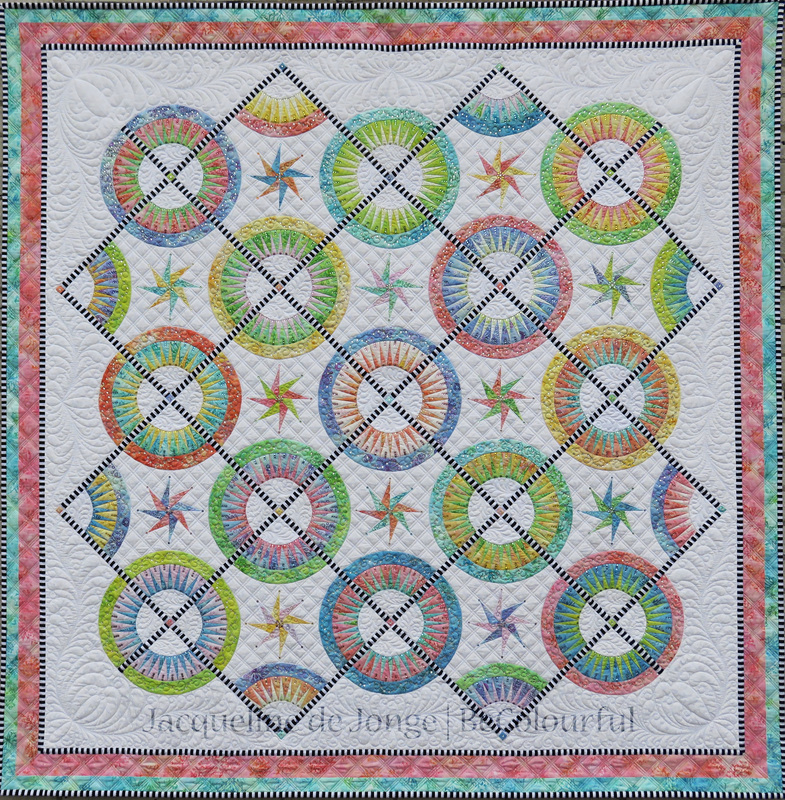 ​The first Bloomingtale quilt is one of the quilts from the Rose Collection. 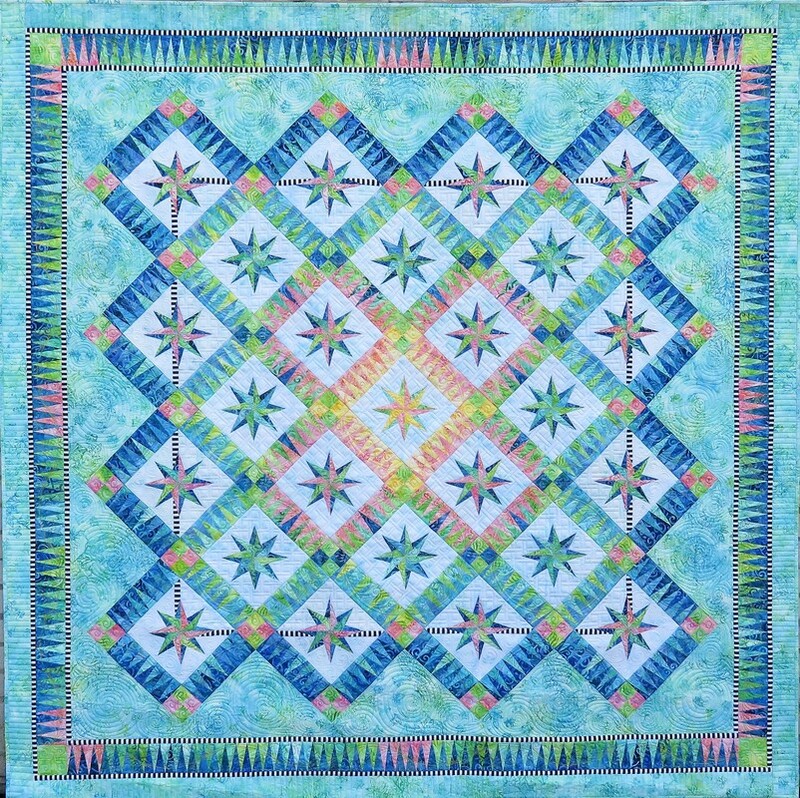 The beautiful borders around the quilt give this quilt its special look. Together with the soft pastels of the rose fabrics the overall look is very delicate. In order to give this quilt a different look, I've made Blooming Tale again but now in French General Fabrics. The reds and the creamy base color accentuated the special shapes even more. The center star, the spiked circle around the star, the flying geese and the New York Beauty arches seems to run under the flying geese borders. 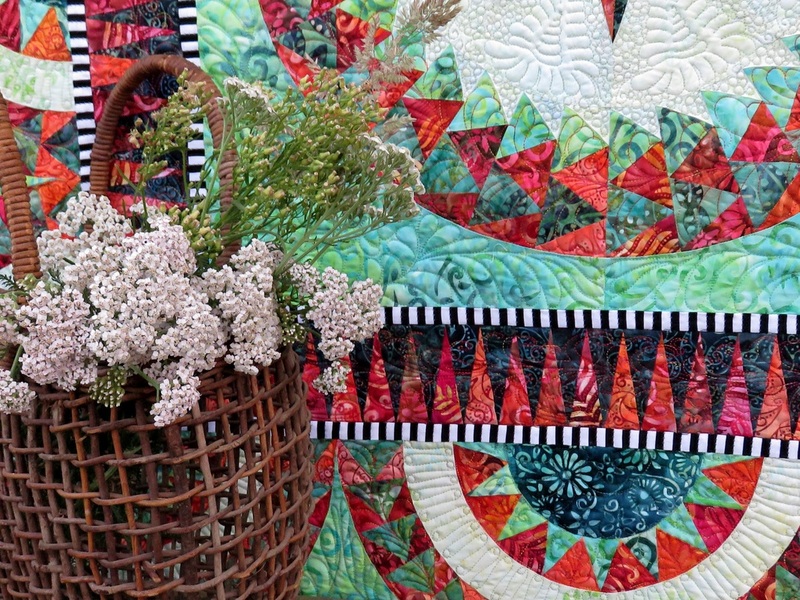 The quilt looks spectacular in a stunning and easy way.